The hay was mowed two days ago. Today, Rodney came with my favorite farm implement, the hay rake. 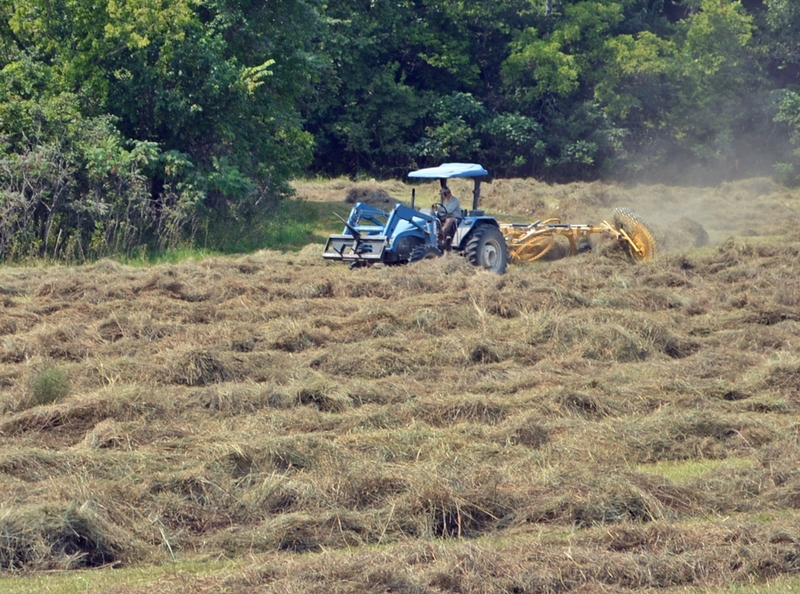 He rakes it into rows so the baler can easily bale the hay. This year, because haying is about two months behind due to weather, those rows of hay are very thick. I hope we get a lot of bales. Rodney keeps 2/3 of them as payment for the baling, I get 1/3 for our goats for the winter. I love the design of the hay rake. It’s so simple, yet so effective. This entry was posted in Castle Argghhh Farm and tagged Farming, Hayfields, raking. Bookmark the permalink. Holy canoli! That is thick. I’m surprised he can do it with that little machine. It’s not as little as you might think. Most of the bales are about 8 feet tall. He makes smaller ones for me, because my little tractor can’t pick up something that big. The ones he makes for me are between 4 and 6 feet high. My neighbor’s makes 6 ft bales, but his rows are never that thick.